Solomon Burke the 'King of Rock 'n Soul' has died today, aged 70 whilst in Amsterdam's Schiphol airport. The singer, songwriter and former preacher was due to perform at a club in the city on Tuesday, along with Dutch rhythm and blues act De Dijk, but after apparently suffering a heart attack on the flight from LA to Amsterdam, he was unable to be resuscitated. The Grammy award-winning singer and Rock 'n Roll Hall of Fame inductee will perhaps best be remembered for his 1964 hit 'Everybody Needs Somebody to Love' which he penned along with Bert Berns and Jerry Wexler. The song was covered a year later by the Rolling Stones and became the signature tune for the 1980 hit film 'The Blues Brothers' where the song was covered by Jake and Elwood (John Belushi and Dan Aykroyd). 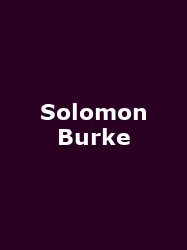 Proving his longevity, Solomon's Grammy award came as late as 2003, with the release of the album 'Don't Give Up On Me', on which he sang original unreleased material by the likes of Elvis Costello, Tom Waits, Nick Lowe and Bob Dylan amongst others. Earlier this year he played Camden's Jazz Cafe as well as dates in Gateshead and Exeter, with a Glastonbury performance in 2008. His statement to the Telegraph that he would "perform as long as he has breath" proved prophetic. Burke leaves behind a sizeable family of 21 children and 90 grandchildren.